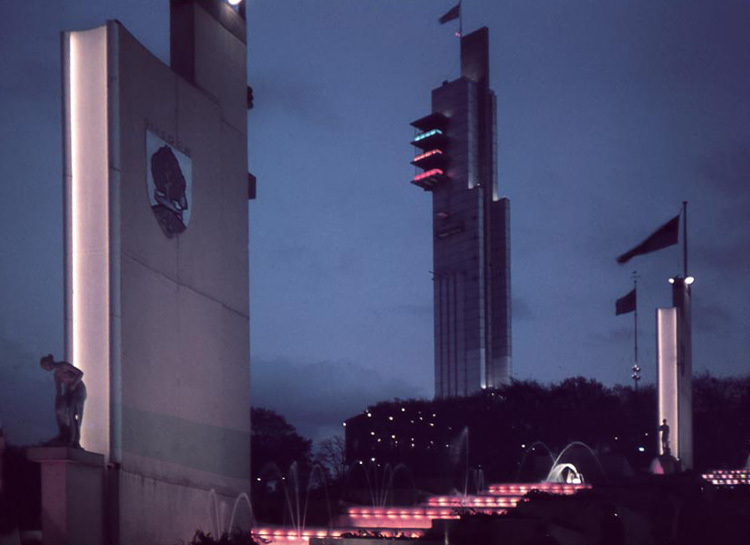 2017 marks seventy-nine years since the Exhibition. Reflecting on current political and social economic trends perhaps we can identify, more than ever, with the ideology behind the event and the need for this occasion by the visitors who attended. 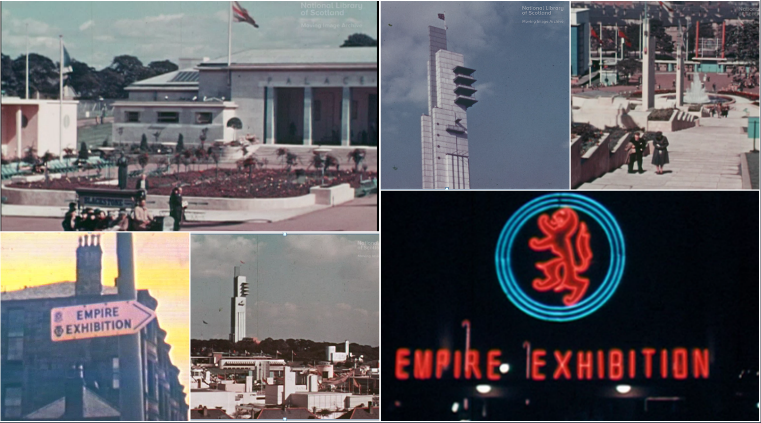 I have chosen a collection of films from the archive that give an overview of the space, the architectural achievements, the visitors and the overall modernity of the Exhibition. There was a sense of nostalgia at the Exhibition. The Scottish Avenue promoted Scottish trade with exhibition spaces (Pavilions) dedicated to Scottish brands such as Tennent’s Lager. Whilst The Dominion Avenue held Pavilions dedicated to countries with ties to the old British Empire such as South Africa. At a time of uncertainty perhaps it was felt looking back created a sense of stability and resilience. However the Exhibition also looked forward, it inspired, created jobs, produced prominent architects and engaged those who visited. Over 174 acres of Bellahouston Park, in excess of 100 temporary buildings required construction in less than ten months. The downturn in shipbuilding provided an opportunity for both Tait and unemployed workers. Approximately 10000 people were employed for construction. With a further 876 employed to run the Exhibition. 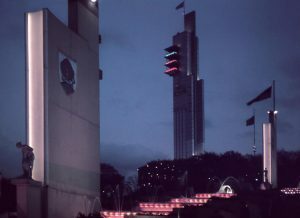 The Tait Tower was the remarkable centrepiece. Two lifts carried visitors’ 300ft for views over the park and surrounding area. Up to 600 people could enjoy views over the City at one time. 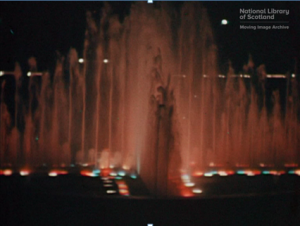 The main water feature was a 400ft lake running along Dominion Avenue. The fountains shot water 100ft high, illuminated by floodlights of varying colours. 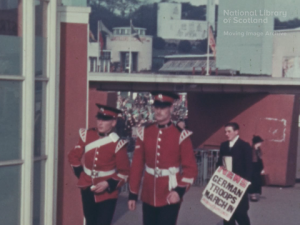 The Exhibition also housed a replica Highland village, a cinema, a concert hall, a 12-acre amusement park, various restaurants and more. In total 716 exhibitors took part. A 3D model of the park can be viewed here. The Exhibition inspired many at an uncertain time; it provided work and a sense of hope to the local people of Glasgow. Andy MacMillan visited the Exhibition as a nine-year-old child and felt inspired. Andy went on to become a leading architect best known for St Peter’s Seminary at Cardross, regarded as one of the finest modernist building in Scotland. Although no more I encourage you to view the footage from the Exhibition and I guarantee you, like Andy, will be inspired. To view Empire Exhibition film visit The Moving Image Archive here: here. Perilla Kinchin and Juliet Kinchin, Glasgow’s Great Exhibitions 1888, 1901, 1911, 1938, 1988, Pub. Bicester, White Cockade, 1988.